Intellidimension released its latest RDF data storage solutions for Microsoft Windows and the .NET Framework... Read More. 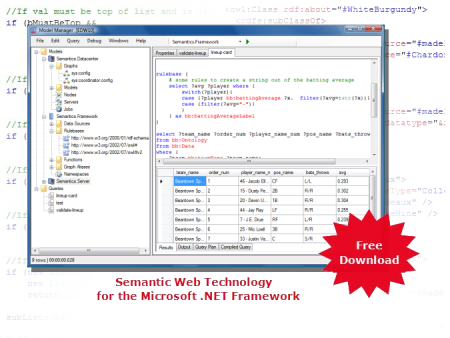 Learn how to build Semantic Web applicaton using Microsoft .NET/C# and SQL Server... Read More. Intellidimension has entered into a multi-year Semantic Web technology partnership with Matrikon... Read More. Intellidimension, founded in 2000, provides solutions to satisfy today's demands for richer information by providing Semantic Web technology and tools for Microsoft Windows, the Microsoft .NET Framework (C#) and Microsoft SQL Server. Our products include massively scalable RDF data stores including SPARQL on SQL Server, rich RDF libraries that are ideal for Microsoft .NET developers using C# and visual developement tools that enable SPARQL query and inference rule design.